Our ancestors didn’t have the “benefit” of local weather reports. Yet, they were able to predict weather patterns and plan accordingly. Throughout the years, sadly, that skill has been all but lost. The first skill you should master is identifying clouds and cloud formations. Cirrus clouds are the most common high clouds. They are wispy clouds blown by the wind into long ribbons. Cirrus clouds are usually white and predict fair to pleasant weather. If you watch the movement of cirrus clouds, you can predict which direction weather is approaching. Cirrus clouds usually indicate a change is coming, probably, within twenty-four hours. Cirrostratus clouds are thin, high clouds that often cover the entire sky and are usually visible twelve to twenty-four hours before rain or snow. Cirrocumulus clouds are small white puffs in long rows, almost like ripples on water or scales of a fish. These are usually seen in the winter and mean fair, but cold, weather. Altocumulus clouds appear as gray puffy masses, usually grouped together. These are often seen on warm mornings which translate into late afternoon thunderstorms. They also appear after storms. Stratocumulus clouds are low, puffy and gray and usually form in rows with blue sky in between the rows. Although rain rarely occurs with stratocumulus clouds, but can turn into nimbostratus clouds over time. 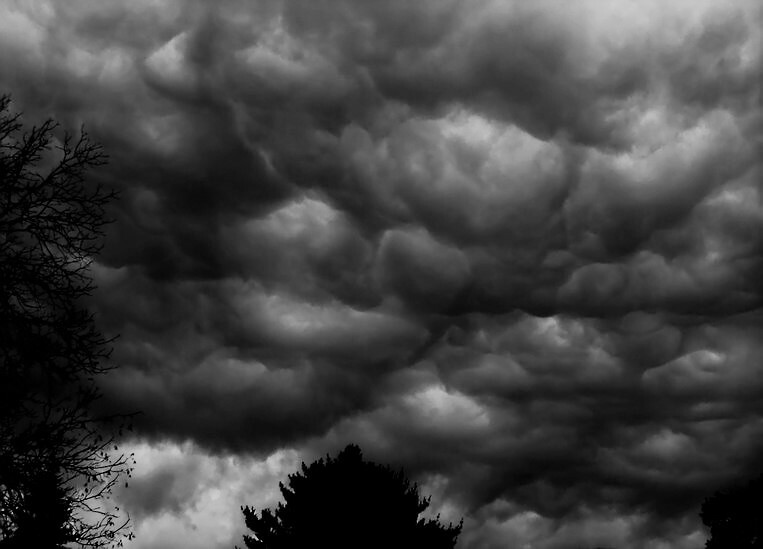 Nimbostratus clouds are a dark gray cloudy layer related to continual rain or snow, although the precipitation is usually just light to moderate. Cumulonimbus clouds are what most simply call thunderstorms. Soaring winds flatten the top of these clouds into an anvil shape. The anvil usually points in the direction from which the storm is coming. Cumulonimbus clouds signify heavy precipitation (either rain or snow) often with hail, lightning and even tornadoes. Mammatus clouds are low hanging segments of cumulonimbus clouds and are also usually associated with severe weather. Cirrocumulus clouds look like undulations on the water and are indicative of good weather. Altocumulus clouds also indicate fair weather is returning as they usually are visible after a storm. Cumulonimbus clouds have a characteristic flat, anvil-shaped top. These clouds promise hail, strong winds, thunder, and lightning. If you use the knowledge you develop about cloud formations along with natural signs (animals, plants, etc. ), your predictions of the weather should be as good, if not better, than your local meteorologist. • The moon will have an opaque halo before it rains. • Cows are a very good indication of coming rain. Watch cows – they will stand facing away from the direction of the brewing storm and they will lie down prior to precipitation. Most herd animals will gather in groups and all face in the same direction prior to a storm. • Scarlet pimpernel is also known as the “Poor Man's Barometer.” The flowers, prior to a drop in atmospheric pressure, will close in anticipation of the coming rain. • Flower scents are stronger when the air is moist, such as before it rains. • For beekeepers, pay attention to their activity. Bees cannot fly against strong winds and, definitely, do not like getting wet. There will be an influx of bees returning to the hive prior to a storm. • The old saying…”red skies at night, sailors’ delight; red skies at morning, sailors take warning” is true. If the sunrise is red, it is indicative of a low pressure bringing moisture and, ultimately, a storm. If you hone your homesteading skills, you will find that your chores around the farm will not be dampened by an unexpected downpour.